Feb 26-28: IIT Bombay. Seminar on Nuclear Security. Subject matter experts drawn from Texas A&M University, Oak Ridge National Laboratory, International Atomic Energy Agency (IAEA), U.S. nuclear power plant, Indian academics and Industry. Oct 16: Army War College Mhow, Panel discussion on Nuclear Dynamics-Operationalizing the The Indian Nuclear Triad. With particular ref to the sea based deterrence. 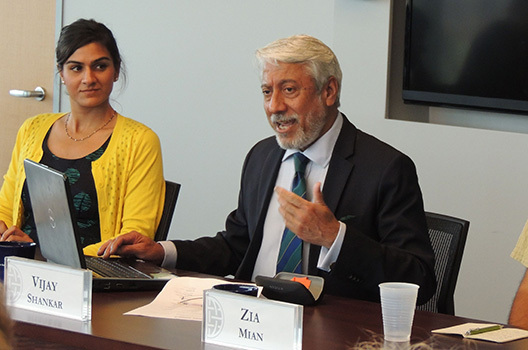 Oct 11: NIAS discussions on Uranium Constraints in Pakistan. Aug 04: National Law School Seminar, International Law & International Relations. Speakers included: Amb TCA Rangachari, Manimuthu Gandhi, Supriya Rao,Mani Shankar Aiyar, Abhijit Iyer Mitra, Bedavyasa Mohanti. Spoke on International Law & Maritime Affairs; it set off a very vbrant discussion and Q&A session particularly on China’s revisionist agenda, the frailty of UNCLOS and Systems at sea and the paradox of Order in the time of Derangements. Outline of the PPT: International Law & Maritime Affairs the Tussle between Sovereignty and Universality-Mahan’s Prescient Perspectives-Concept of the Global Commons and Nature of Domain-Governance and Order at Sea-Derangements and Power Struggles-Laws of War & Rules of Engagement. July 05-06: Maritime Warfare Centre, Kochi; Diamond Jubilee Seminar. March 29-30: Western Fleet Golden Jubilee. Admiral Nayyar made an erudite analysis of the evolution and intellectual development of the Fleet through anecdotes and personal experience. On the third wave transformation underway that would establish the vision and reach of the Fleet, the Quad provided the stage for just such a renewal. The venue for the presentation was Vikramaditya. March 21-22: DSSC Aerospace and Nuclear Seminar 2018. Key note address and Chair Nuclear session. November 7: Georgetown University, School for Foreign Service. Lecture: “Staring Down the Abyss”. July 04: NIAS, International Strategic and Security Studies Programme. Deliberations on proceedings of the First Meeting of the Nuclear Crisis Group (NCG) held at Vienna. The real peril in the nuclear domain lay in the inability of formal establishments to track potential situations of nuclear conflict. If such risks remain ignored, misunderstood or mismanaged, they could even lead to unintended consequences. Recognising this, an international crisis group was formed as a sub-set of Obama’s nuclear legacy, a Global Zero Commission on nuclear risk reduction. The primary mission of the forum would be to generate analysis of these predicaments, develop proposals for de-escalation and consult with appropriate agencies to diminish the danger of nuclear exchange. The Group, an international assemblage of experts from nuclear armed countries and their allies has been set in order to realise this prospective initiative. Along with the deliberations of the meeting, the general features and purpose of the NCG, Admiral Shankar will also be addressing the various nuclear flash points that the NCG has identified- with a focus on the situation in the sub-continent. Global Zero’s newly formed Nuclear Crisis Group will hold their first conference on May 5-6, 2017 in Vienna, aligned with the NPT PrepCom. The conference – the Nuclear Crisis Roundtable – will be co-hosted by Global Zero and the government of Sweden and will take place at Schwedenhaus, Sweden’s embassy in Vienna. The Nuclear Crisis Group is an international group of esteemed experts from nuclear countries and their allies. The group will constantly track situations of potential nuclear conflict that risk being catastrophically ignored, misunderstood or mismanaged. It will produce analysis of these situations, develop proposals for de-escalation measures and conduct ongoing consultations with governments to de-escalate well before the nuclear threshold is crossed. This initiative builds on the work and expertise of the Global Zero Commission on Nuclear Risk Reduction. Co-chaired by Ambassador Thomas Pickering and General (ret.) James E. Cartwright, invited South Asian representatives at the roundtable are Vice Admiral (retd.) Vijay Shankar (India) and Gen. (retd.) Jehangir Karamat (Pakistan). Recent Reported Firing Trial of the Babur III. The Rafael Grossi’s Letter For Non-NPT Applicants to the NSG. September 28 : Book launch Address critical acclaim for “Left of Boom” or “No War. No Peace?” Authors: Perkovich and Dalton. 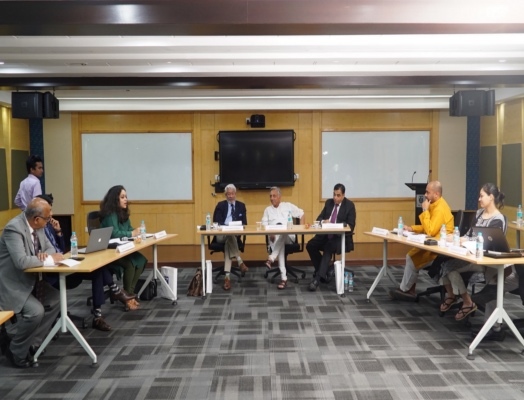 May 6: Roundtable discussion on “Evolution of the Deterrence at Sea,” Carnegie Endowment for Peace, Washington D.C.
April 4-6: Oak Ridge National Lab, Tennessee USA (ORNL), National Institute of Advanced Studies (NIAS), and IIT (Delhi) Cyber Security Workshop. 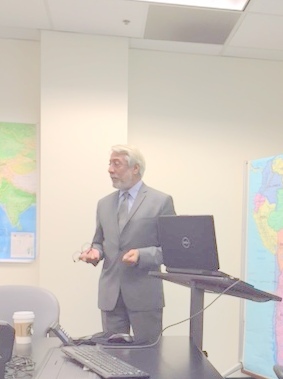 October 29: “Nuclear Submarines and Maritime Security in South Asia” Naval Postgraduate School, Monterey, CA. October 14: “Maritime Security in South Asia” Center for Strategic and International Studies, Washington DC. September 14 (AM): Confabulations with the International Security Advisory Board (ISAB, Sec. John Kerry’s) on “The Nature of Strategic Stability on the Sub Continent,” State Dept. Washington DC. September 14 (PM): Presentation and Round Table discussion, “Nuclear Doctrinal Debate,” Carnegie Endowment, Washington DC. May 3-7: Speaker, Fifth Annual Residential Young Scholars’ Workshop, Global Nuclear Politics and Strategy 2015, Institute for Peace and Conflict Studies and National Institute of Advanced Studies, Bangalore. September: Atlantic Council, Washington, DC. Roundtable discussion on “Nuclear Security on the Subcontinent.” Audio of discussion available here. June 20: National Defense College, New Delhi. Talk titled “Strife on the Global Commons: The High Seas”. Vice Admiral (Retd.) Vijay Shankar speaking on Maritime Security in the Indian Ocean Region and the ‘Uncertainty Paradigm’ at the Strategic Studies Summit, Bangkok, 23-25 February 2014.